Adam Jahnke (hey, that’s me!) is a professional writer whose work has crossed multiple genres and mediums. Jahnke’s Electric Theatre (that’s the site you’re currently visiting) is your online source for blogs and reviews by and the latest information about Adam Jahnke (again, that’s me). Adam Jahnke…OK, enough of this third person nonsense…I began my career with Troma Entertainment where I learned the ropes and worked in all facets of the entertainment industry. 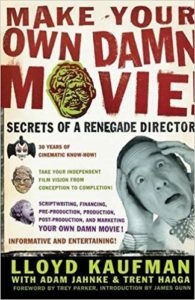 Among many other projects, I wrote 20 episodes of Troma’s Edge TV for Channel 4 in the UK, co-wrote the bestselling nonfiction book Make Your Own Damn Movie! 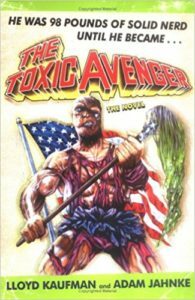 with Troma President Lloyd Kaufman and Trent Haaga, and wrote the Scribe Award-nominated novelization The Toxic Avenger: The Novel, based on Kaufman’s 1984 cult classic. In 2000, I joined the staff of The Digital Bits, one of the longest-running and most respected DVD and Blu-ray websites. There I contributed such popular columns and features as the annual Hell Plaza Oktoberfest, JET’s Most Wanted (spotlighting obscure films unavailable on DVD), and filmmaker interviews including Ray Harryhausen, John Landis, Richard Donner, and many others. As a freelancer, my work has also appeared in such outlets as Geek Monthly, The Morton Report, MusicTAP, and elsewhere. Over the years, I’ve worked on a number of film and television projects, some of which have been made, most of which have not (yet). Recently, I’ve ventured into the world of podcasting, joining Zero Mile Media as Head Writer. 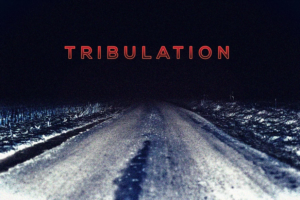 Our first project, the serialized fiction podcast Tribulation, is available now on Apple Podcasts, Spotify, Stitcher, Radio Public, and on the official Tribulation website, This Hollow Earth. The Electric Theatre originally began as an offshoot of my work at The Bits, a catch-all area to review movies, music and television without the constrictions of the Bits’ technical focus. Today, it’s my little corner of the interwebs, a place for me to post blogs and reviews of whatever strikes my fancy and to share the latest info on any other projects I’m working on. I hope you’ll enjoy the stuff I post here. I look forward to hearing what you think.